Arriving at our room at the Library Hotel we found a book entitled Karma on the bedside table, another about the Dalai Lama on the desk and a shelf of books featuring the likes of Buddhism, Taoism and Meditation. This was not however a specific hint from the hotel that we should make our visit to downtown Manhattan a particularly chilled experience. We actually had the fortune (Karma?) to have been checked in to room 1200.001. This actually represents the section Eastern Religion in the Dewey Decimal system, a book categorisation method used in almost every library worldwide. The Library Hotel has cleverly organised the hotel so that its ten floors takes one of Dewey’s major classifications whilst the sixty rooms are allocated a sub-category. In each plenty of shelf space is given over to housing books from your allocated code. Bookish themes continue in the public areas of the hotel floor to ceiling shelves in the lobby acting as eye-catching decorative features whilst a very good inclusive breakfast. The bookish Reading Room is home to coffee, tea, cookies and fruit through the day before the – once again complimentary – Prosecco, wine and cheese are served in the afternoon. The stunning rooftop terrace of this historic brick and stone building is dubbed the Writers Den & Poetry Lounge before being swiftly reinvented as the Bookmarks Lounge for the buzzy evening sessions where you can enjoy the lights of the city skyline. For dining later Madison & Vine is an American style bistro located on the ground floor. The rooms are, rather appropriately, somewhat understated. Featuring dark woods, beige floors and creams walls where dark framed pictures of eastern icons are hung. The bathrooms are modestly sized but perfectly formed – usually with a bath and stand up shower with curtain. They feature marble and stone coloured tiles along with the added dark mahogany wood features and pleasant toiletries. There are some nice extras (other than books!) in the rooms like premium cable TV, DVD player (and film library access) plush robes and mp3 player. No rooms have two beds, but dont despair! The Library Hotel is part of The Library Hotel Collection – an expanding mini chain with three sister hotels in NY city alone and where you can find plenty of other bedding configurations. All in all we loved the Library Hotel. It doesn’t attempt to appeal to a luxury clientele but aims – and delivers – a comfortable and quirky four star stay in a perfect mid-town location. 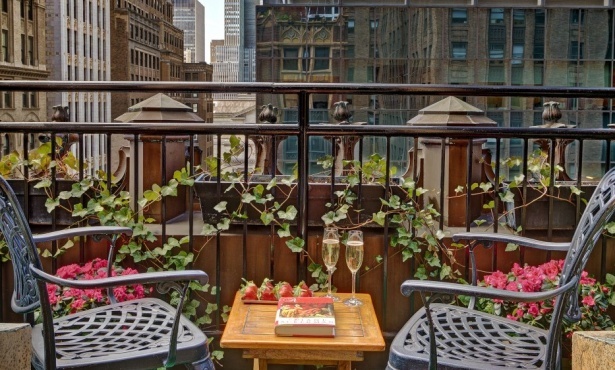 All the little extras and the complimentary breakfast and afternoon cheese and wine help provide value whilst the enthusiastic staff and roof top bar make this a perfect stop for a fun New York leisure stay. Images by The Library Hotel.